Polititainment, Recreational Outrage and Competitive Victimhood, are not only clever, insightful and intriguing all on their own, but are also all tightly linked together. Follow me down this oh-so-21st-century rabbit hole… It’ll help you beef up the quality of your BS Detector. Polititainment – I came across this notion in a recent editorial in the Atlanta Journal Constitution. The meaning of the term is immediately obvious – it’s a piece of media content that is a combination of politics and entertainment. The main example used in that article is a perfect illustration. It recounts the “High School Kids in Make America Great Again Hats vs. the Native American Elder” story. You remember. Feels like it was quite a long time ago, doesn’t it? The incident itself happened on January 18th; which was actually only two months ago. The storm surrounding the incident raged for almost 2 weeks; which is a whole lot longer than most polititainment stories. “Why was the story so big and why did it last so long?” you ask? Well… First of all, it had the classic “Evil vs. Sympathetic Figure” foundation that is the core of great storytelling. Think of any Disney movie you’ve ever seen – Cinderella vs. the Evil Stepmother, The 101 Dalmatians vs. Cruela DeVille, etc. It also had multiple genuine political elements, including, among other things, the symbolism of the MAGA hats, Native American activism and Black Hebrew Israelite religiosity. Take that stew of core elements, and even a rookie copywriter can churn out a compelling story that can be distributed in text, image, audio or video form. And there’s more! Add in some lively debate. Let’s get a defender of white, Catholic kids, a defender of Native American rights and a defender of Black Judaism. Let’s record them shouting at and over one another for the industry-standard 141 seconds. Set this clip up with a teaser. You know… Something like, “Stay tuned for breaking news about another outrage in our nation’s capital!” But first… a word from our sponsor…” And there’s still more! This story gets flipped on its head! The smugly grinning, arrogant, white kid turns out to be the innocent victim. The courageous, elderly Native American turns out to be the perpetrator of the whole thing. As a bonus, the Black Israelites are still being persecuted. More text! More photos! More podcasts! More Video! More heated debates! And then, in only 2 weeks, the whole thing vanishes. Totally The entertainment value is spent. There was no real political content in the first place. Got it? There – was – no – real – political – content – in – the – first – place! It was nothing but intellectually content-free entertainment. How about some Recreational Outrage? The definition of this term too is pretty much self-evident. Both of its major forms are addictive. An example of the first form is the polititainment I just discussed. Have you ever yelled at your TV during a news show? I have. It’s rare, in fact, that I get through a news show without at least muttering to it. It’s cathartic. It feels good. Just like other types of recreation. The second form is even more therapeutic. I’ll provide an example, and I’m sure you’ll be able to relate. I talk on the phone regularly with a buddy I’ve known for forever. His parents and my parents were friends, so we met before our ability to talk had even developed. Just this morning, he called me. Without even saying “Hello,” he launched into a tirade about the bribing of college admissions officers and coaches. He raged on for a good 2-3 minutes then had to gasp in some air. Given that few milliseconds long opening, I took over the rant for the next 2-3 minutes until I needed to breathe. We traded back and forth and repeated that process regarding Trump’s newly proposed, by-far-the-largest-in-history federal budget, the Green New Deal and the dismal performance of this past season’s performance by the Philadelphia Eagles. So Recreational Outrage is good for you, right? Well… Yeah. Partially. What’s spooky is that it’s gone way too far. Stop and think about the number of outraged conversations you witness all around you, along with the times you are one of the participants. Ever follow a conversation on Twitter or Tumblr? The polititainment surrounding us nudges us into our own outrage, which makes us crave more polititainment, which nudges us into more outrange, etc., etc., etc. 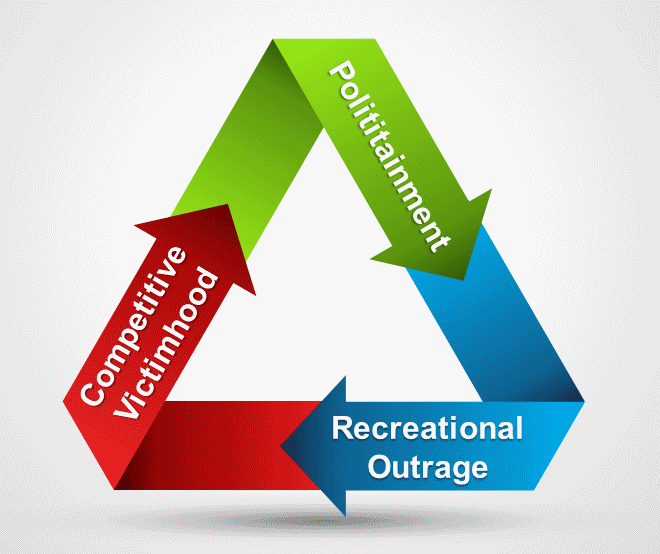 Recognize that Recreational Outrage is nothing more than RECREATION! It is NOT serious discourse or deep thinking, and has very little lasting value. Which brings us to Competitive Victimhood. As in, “You think you got screwed… Lemme’ tell you my story!” And seriously, folks… It’s a real thing! Google it. You’ll find all kinds of scholarly research. For most, if not all, of human history, being the victim of a tragedy, very appropriately triggered compassion, generosity and support from others. The classic illustration of these victims of fate would be “widows and orphans.” As the 20th century progressed, in addition to fate-driven tragedy, recognition of human-driven tragedy also came to be widely recognized. Victims of slavery and the Holocaust being two particularly egregious examples. The scope of victimhood continued to expand, and then to expand at an accelerating pace. The introduction of Intersectionality by Kimberlé Crenshaw in the late 1980s marked an inflection point. The basic concept is that an individual can not only be a victim, but can also be even more victimized when two or more victimization factors intersect. A Jew in Nazi Germany was clearly a victim. An orphan in Nazi Germany was clearly a victim. A Jewish orphan in Nazi Germany was doubly a victim. A Jewish orphan in Nazi Germany living in Dresden when it got fire-bombed was triply a victim. And it takes a human oppressor to create a human-induced victim, right? A victim is the victim of one or more oppressors, and intersectionality applies to oppressors as well. Consider the white, male, Ivy League college educated, heterosexual, millionaire baby-boomer from a happy, well-adjusted, two-parent, low crime, small-town household, who owns guns, watches football, drinks beer and votes Republican. How hard would you need to work to find someone more horrendously odious than that??? It’s really that simple. That’s why so, so many people are diligently developing and displaying their Competitive Victimhood skills. They all want to be ready to go for the gold in the next Oppression Olympics. Actually, that too is pretty darn easy. Just remain aware. Remain aware that the media – all of it – is primarily funded by advertising, and that entertainment is far and away the leading attractor of media advertising dollars. Most of your political news will come at you in vacuous entertainment form – as Polititainment. Remain aware that ranting is fun. Outrage is fun. How can Recreational Outrage NOT be an outstanding source of fun? I like to rant, you like to rant, we all like to rant. I, you and we like to listen to rants. Mass media outlets know this and get better every day at feeding us more and more intellectually empty, yet highly entertaining Recreational Outrage. Remain aware that real, legitimate victims do exist. Lend them a hand. Also remain aware that any victim with a self-description containing more than three descriptors is probably a low-life scam artist. Like, minority, gay, immigrant, for example. Ditto if the victim uses more than three descriptors to describe his or her or [Insert Your Preferred Pronoun here] oppressors. You know, like the white, male, beer-swilling heterosexual. I’m your Intentionally Vicarious host Todd Youngblood. I will continue to entertain myself by following polititainment, the endlessly fun political follies. I will continue to rant at will because it makes me feel good. I will continue to compete at all sorts of things, but never at Victimhood. I’m no victim. Never have been. Probably because I have and still am having more fun than anyone else I know.